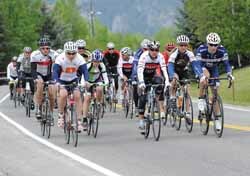 June 18, 2011 on the 12.4-mile course from downtown Ketchum to Trail Creek Summit, sponsored by The Elephant's Perch of Ketchum. There were 46 finishers—41 men and 5 women. Age range was 11 to 74, with the average age 43.4 years. Finishing times listed in minutes and seconds, and hours, minutes and seconds, with age after a racer's name. Travis Ballard 4:54, Matt Luhn 3:21, Billy Collins 2:48, Scott Grill 2:32, David Taylor 1:49, Jon Holmquist 1:09, Richard Feldman 0:51 and Tom Campion 0:14.